Lamine Kone is relieved that he is now fulfilling his Premier League dreams after admitting he thought his chance to join Sunderland had gone. Centre-half Kone enjoyed an excellent debut against Manchester City last night, despite Sunderland suffering a 1-0 defeat which left the Black Cats’ survival prospects looking ever more perilous. Everything’s changed in my life and I’m adapting to that. 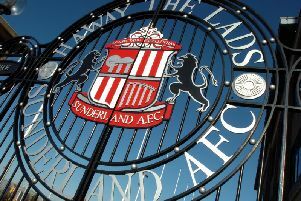 Sunderland landed Kone at the third time of asking in the final week of the transfer window after two previous moves had fallen through. After Sunderland appeared to have abandoned their interest when the Kone pursuit collapsed on a second occasion, the Ivory Coast international expected to continue his career at French club Lorient. But when the Black Cats made a third and final £5million move for Kone, the 27-year-old was able to finally complete his move to the Stadium of Light. Kone said: “Yes, I thought I would be staying at Lorient last week because the transfer at the start of the window had fallen through. “But then everything changed when Sunderland renewed their interest and eventually, it was a happy ending for me. “I’m very happy to be here now. “Everything’s changed in my life and I’m adapting to that. “The French-speaking players here are helping me - Younes Kaboul, Yann M’Vila and Wahbi Khazri. Sunderland merited a share of the spoils against City after a spirited display when they put Manuel Pellegrini’s side on the back foot for long periods. But Sam Allardyce’s men couldn’t take advantage of their opportunities, with Kone missing one of Sunderland’s gilt-edged chances when he headed wide from eight yards out. “It was a shame that we didn’t get anything, because we played a good match,” he said. “We could have been 2-1 up at half-time because we had some great chances and gave Manchester City some problems. “I had a chance when I got in front of the defender, but I didn’t make a good contact with my head. It was a great chance to equalise for the team.